Where: In woodland, and on heathland and grassland. How many: Around 400 - 500 roe deer are present. Herds: Apart from during the mid-summer rut, roe deer are often quite solitary creatures, although single does and youngsters of the previous year are often seen together. Bucks and does are typically seen together only during the rut, but groups of roe deer may feed in close proximity at other times of the year, attracted by the availability of foodstuffs rather than the prospect of each others company. Size: Quite small, dainty creatures, up to 65-73 centimetres (26-29 inches) at the shoulder. Bucks are larger than does. Coat: Summer coat is bright reddish brown; winter coat, dark grey/brown above, paler below. Adult roe deer do not have spots. New born fawns have some spots. Black nose fringed with two white spots, and white on the lower jaw. Rear end: Pale, powder-puff caudal rump patch, fluffed out when alarmed. No tail, although winter females have a short tuft of white hair that often looks like a tail. Antlers: Quite short, fairly straight, usually 3 points on each. Sounds: Year-round cough-like bark; low grunts during the rut. Roe Deer are animals that have spectacularly triumphed in the face of adversity, creatures that with a little help have cocked-a-snook at man and his modern ways. They are natives of these Isles – the fossil records show roe deer presence way back in pre-history. 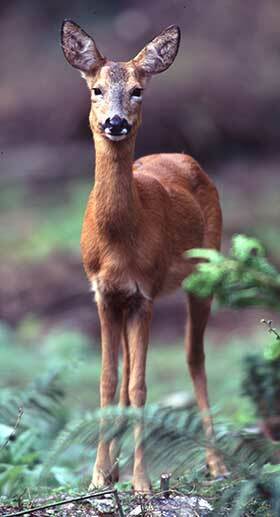 But by the end of the 16th century, roe deer were extinct in the New Forest and elsewhere in southern England. And why was this? Well in the 14th century, they were relegated by royal decree from ‘beasts of the chase’ to ‘beasts of the warren’, and previously enjoyed protection under Forest Law was removed. Roe deer were then quite literally hunted out of existence. But in the early 19th century, roe deer from Scotland were reintroduced at Milton Abbas, Dorset. These animals prospered and so did their descendants, spreading in the second half of the 19th century as far as the New Forest, albeit initially in very small numbers. Now the tiny roe deer is once more widespread, willing and able to live side-by-side with man. Man, though, is not always so enthusiastic - roe deer habitually visit country gardens and snack on roses and other shrubs, whilst their habit of damaging trees, hazel coppice and ground flora fails to endear them to woodland managers. Here in the New Forest, the roe deer population is maintained by culling at between 300 and 500 animals. 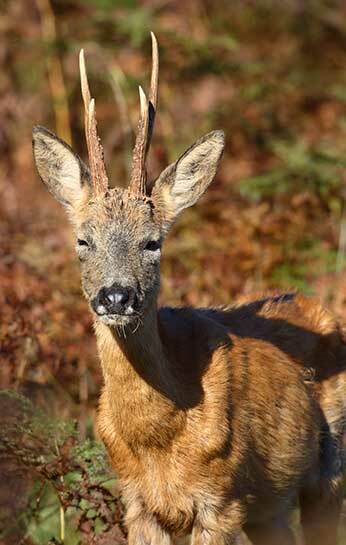 Roe deer, though, do not fare particularly well on the open lands of the New Forest where they find it difficult to compete for food with the larger deer species – sika, red and fallow deer - and commoners’ cattle and ponies. Consequently, many New Forest roe deer are found around the edges of the Crown Lands where nearby agricultural land and gardens provide a reasonably reliable food supply. Unlike the other New Forest deer, roe deer are usually seen alone or in very small groups comprising mum and last year’s youngster, with maybe a buck nearby. Then whilst red deer, fallow deer and sika deer usually give birth to single youngsters, roe deer outside the New Forest often give birth to twins, and sometimes even triplets. In the New Forest, however, where mum is less well fed, single roe deer births are much more common. And in late September and October, when other deer are busy rutting, the contrary roe deer takes things easy, and rests after its own late-July and August rut. Yet cleverly, delayed implantation of the blastocyst into the uterine wall defers growth so as to ensure spring births at around the same time as the others. Often known as the fairy-of-the-woods, the name is entirely appropriate, for these charming, attractive, petite creatures can seemingly, at will, melt into the undergrowth, disappearing in an instant from sight. Even the roe deer rut is a relatively inconspicuous affair, which perhaps should not be surprising given the solitary habits of the species. Not for roe deer the noisy, communal gatherings of red, fallow and sika deer. No, the Roe Deer rut is altogether a calmer, perhaps more sophisticated business usually involving just buck and doe, without onlookers. Other roe deer habits are often cloaked in mystery, the oddest of which, surely, is their liking for chasing one another around tree trunks or broken stumps, in the process removing all vegetation in their path, leaving for all to see a roe ring, a circuit of bare earth liberally sprinkled with slots and, often, remnants of hair. Roe rings are usually associated with breeding season pranks as buck chases doe in courtship ritual. However, these rings can sometimes be found fresh and trampled in the depths of winter, way outside the rutting season. Perhaps they’re then just practising.